Real Madrid and Croatia midfielder Luka Modric won the 2018 Ballon d'Or, becoming the first player other than Lionel Messi or Cristiano Ronaldo to claim the award in more than a decade, said media reports. Former Brazil and AC Milan forward Kaka, in 2007, was the last player other than Messi or Ronaldo to win it, reported BBC. Ronaldo, who joined Juventus from Real Madrid in the summer, came second, said the report. Barcelona forward Messi finished fifth, with Atletico Madrid frontman Antoine Griezmann and PSG attacker Kylian Mbappe - both of whom won the World Cup with France - third and fourth respectively. Victory caps a stellar year for Modric, who also was named the world's top male player at the Best Fifa Football Awards and received the Golden Ball award for the best player at the World Cup. 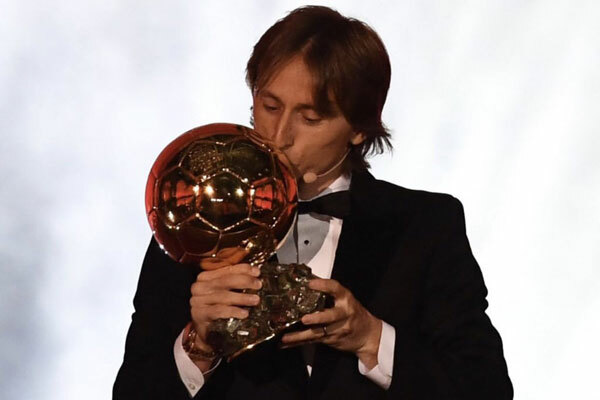 Modric's journey from Croatian war child to the world's best footballer was celebrated Monday when the Real Madrid midfielder hoisted the Ballon d'Or, said Sports24. A national hero in his home country and crowned the best player on the planet, Modric was rewarded for his key role in Croatia's historic run to the World Cup final and his club Real Madrid's third straight Champions League trophy. "It's a unique feeling. I'm happy, proud and honoured," said Modric, who also won the FIFA Player of the Year award in September. Modric is on top of the world after winning the Ballon d'Or but his upbringing could not have been tougher. When the Croatia and Real Madrid superstar was just six-years-old, his entire existence was rocked by the shooting of his beloved granddad at the hands of militant Serbian thugs and he was forced to live life as a refugee in his war-torn homeland, reported The Sun. But despite such hardship, that didn't stop the ambitious kid from going on to become one of the best players on the planet and, now aged 33, a global superstar. "Maybe in the past there are some players who could have won the Ballon d'Or like Xavi, Andres Iniesta or [Wesley] Sneijder but people finally now are looking at someone else," he added.